We are finishing off the Tarts chapter with a recipe that is a bit more difficult both in its composition and components. Our bakers did an incredible job tackling it. The way the tart is structured is very much like how many pastry chefs are presenting tarts these days, a thin layer of crust with a molded strip of "filling" placed on top. It is drastically different than how we've done tarts thus far- roll out dough, press into a pan, bake and pour in filling. Second, the components require careful reading of the instructions to make sure everything is timed properly. Again, much praise for the great writing in the book because it's not impossible, just a step up from what we've done before which seems fitting now that we are half way through the book. Upon reading the recipe, this tart seemed to be the most intricate in the book, and after making it, it was. That's probably why I wasn't excited about making it, also probably due to its untraditional nature. Since I give away most of my baked goods, I had to time it properly so I could finish the tart and give it away immediately. First the easy part, making the streusel. I already had all the ingredients at home so I knew I could make this ahead of time. I didn't have, and couldn't find, any square tart forms so I used square cake pans instead. The streusel came together well, and I cut it to size and placed it in the cake pan to chill. Then, the chiboust. I had never heard this term before, but according to the book, it's a pastry cream lightened with meringue. Sounds good! The instructions recommend to have everything ready before beginning, and this is essential. However, I didn't have enough saucepans to hold all the separate parts, so I improvised and heated up the heavy cream in the microwave. I again had an issue with the egg whites. I managed to get them to stiff peaks, but the meringue wasn't glossy, it was more foamy and a little wet. Not sure if I'm getting bad egg whites, but this time I used fresh ones. The caramel cream lightened up a lot after adding all the meringue. I froze it in a 6 inch cake pan. Finally, ready to assemble. I baked off the streusel, and it smelled heavenly. However, getting it out of the cake pan, it broke into a few pieces. I managed to piece it back together onto the serving platter, added the frozen chiboust, and got out the torch. It bruléed quite well, and I added a cinnamon stick and vanilla bean for garnish. Overall, way too much work for the end result. I generated two sinks full of dishes in under 10 minutes, a new record! Although the tart looks like it could be sold in a fancy patisserie, I doubt I'd make it again. I'm always torn between attempting to adhere to every single aspect of a recipe, and thus buying unusual ingredients and/or new equipment, and being more practical and working with what I have. For this recipe, I did a little of both. Hazelnut Streusel: I made my own hazelnut flour/meal by roasting hazelnuts, removing the skins, and pulsing into a meal in my food processor. I mixed the dough in my KitchenAid mixer using the beater blade with rubber scraper. This worked the dough together nicely, which I believe accomplished the same result as working the dough with the heel of your hand. Chiboust: I took the recipe's advice and had all the ingredients and equipment laid out as instructed. Afterwards, it looked like I had used every pot and bowl in the house. But, really, it wasn't difficult. It reminded me of making an Italian meringue. The timing is the only tricky part. Assembly: I found that I could warm the pastry ring with my hands, and then gently push out the chiboust with my fingers without leaving any indentations in the chiboust. Conclusion: I liked it, but didn't love it. 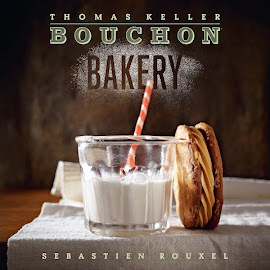 I want to try this at a Bouchon Bakery sometime to see exactly how it's supposed to taste. Hmmmm.....where to start. I really, really put off doing this one till the last minute. Saturday I woke up and literally did everything I could not to make this because the photo just makes it look daunting :(. I made two batches of salted butter caramel ice cream (David Lebovitz) oh my, my, my it's good. I made veggie paninis. I made salsa. I watched the movie 42 and 1 1/2 hours of Buying Alaska. Needless to say, I wasn't super impressive yesterday :). So finally I got around to the chiboust. The Whole Foods closest to my house didn't have hazelnut flour in stock and I had not one intention of driving across Tampa at rush hour on a Friday. So yesterday I made the hazelnut flour. Incredibly easy. Not to mention cheaper. Coincidentally, the chiboust uses the same technique for the caramel as the ice cream so that was easy. The hazelnut streusel was easy to make. The chiboust is a different story. I had never eaten it before so I wasn't sure how it was supposed to turn out. I really wish Bouchon had photos of the process for this one. I misread the instructions and didn't whisk the initial 1/3 meringue so I did it with the second addition and that was a mistake. It made my chiboust shorter than it should have been. Clearly I wasn't thinking. My chiboust looks darker than the one in the book. Maybe I cooked my caramel longer but I'm not sure. I didn't have a shallow 6.5 inch form, so I couldn't get a perfectly flat top which irritated me. I also didn't have the 8 inch form so I used a rectangular tart pan. After making it I realized you don't really need either of those things because you could use any size and adjust accordingly.